← Ploughman’s Lunch: Plough as in Dough or as in Plow?? I make a version of tuna salad that E really likes. It’s one of her favorite meals that I make – and one that she requests ALL.THE.TIME. We’re big fans of using food coloring in this house. Rainbow pasta, dyed ice cubes in our water…fun fun fun! I asked E if she wanted to have anything special in honor of today being St. Patrick’s Day – “Green Tuna Please!” was the response. “You got it kiddo,” I replied. And so – here you go: Green Tuna. This stuff is seriously unappetizing in appearance. And yet – can you hear the 7-year old applauding? 2 cans Tuna packed in Water, drained and then dried on a layer of paper towels – this TOTALLY makes a difference. It’s an extra step but I highly recommend it. 1 heaping Tablespoon Mayo **I use Hellmans. 1 heaping teaspoon Sweet Relish **I buy whatever is on sale. 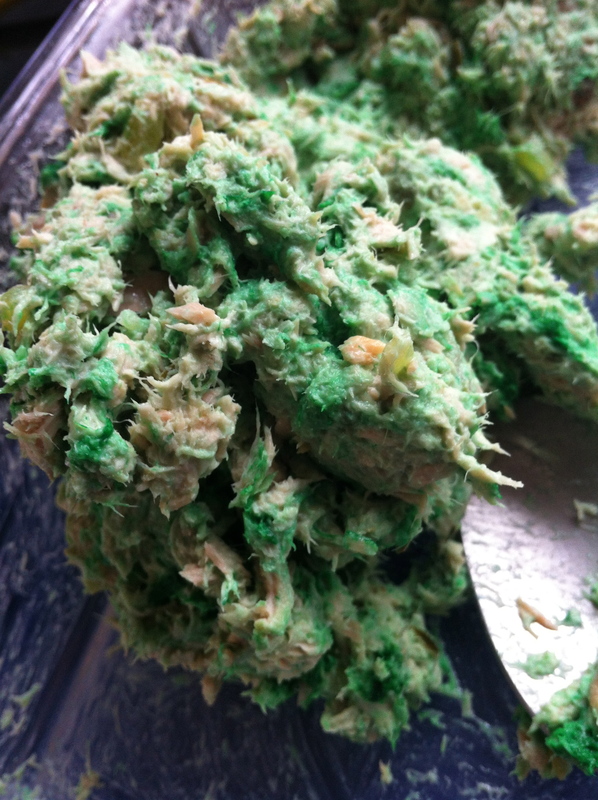 E calls it ‘That Green Stuff.’ She likes it when I add ‘That Green Stuff’ to my tuna salad. **If you’re not feeding a finicky 7 year old, feel free to add in some minced sweet onion (vidalia or red) for some crunch. Also, a rib or two of minced celery adds a nice crunch. If you’ve got it on hand. 1- Drain tuna, dry it on a double layer of paper towels to remove excess moisture. I usually use a spatula or a spoon to mash the tuna into the paper towels so it dries faster. I also tend to walk away and leave it sitting in the aforementioned paper towels for at least 20 minutes. Feel free to do the same. 2 – Dump everything into a bowl and stir. If you’re making this ahead of time you should choose a bowl that has a lid so you can shove everything into the fridge for later. Today we’re gonna eat this on bread dyed with green food coloring too. I usually paint the food coloring on the slices of bread with a food safe paint brush (I bought mine at a crafts store). If you have a shpritzer available or wanna dip your bread in a shallow filled with food coloring, those are other ways to go about this. 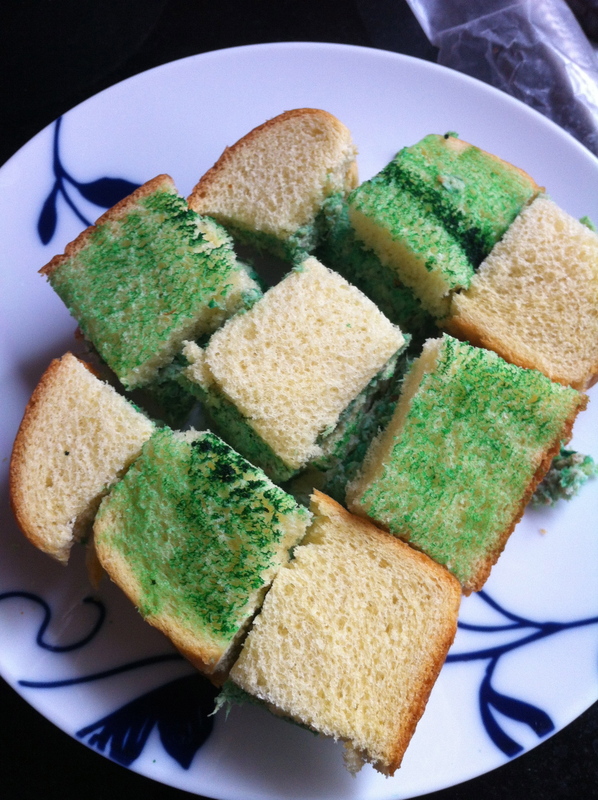 Then again, you could just make drop-colored bread or use the finger-painting method…. Up to you. 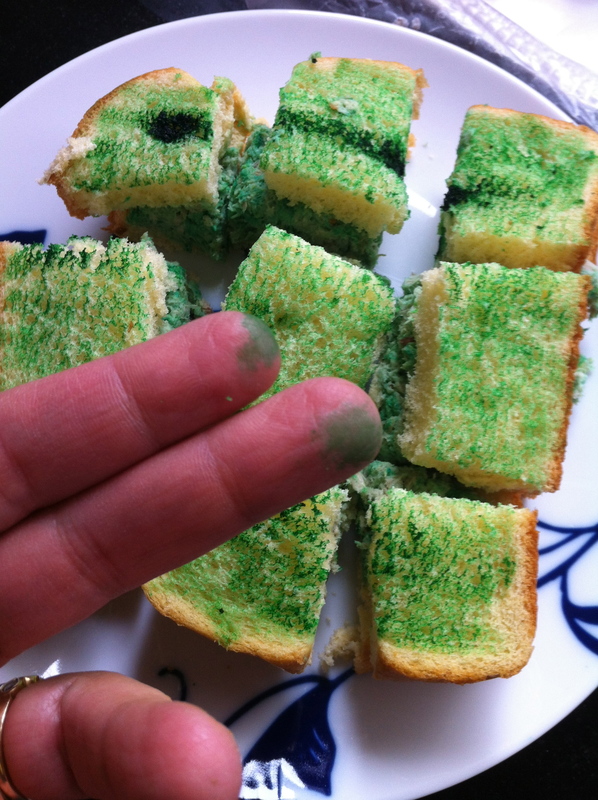 Be forewarned: the food coloring won’t dry on your bread so this is a potentially messy meal. 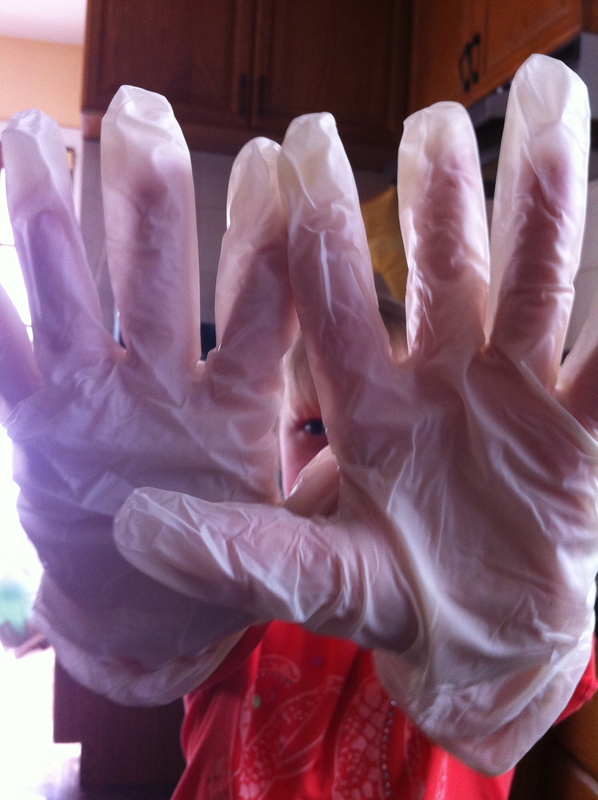 E and I agreed: gloves will be necessary at dinner tonight.